Ningbo Beilun Rihong Machinery Manufacturing Co., Ltd. 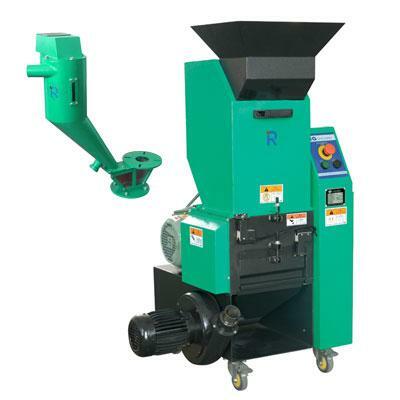 Powerful Granulator(RG-26/36 ), The granulators of RG-26/36 series are suitable for crushing various defectives, wastes and offcuts made of soft or hard plastics in block, ball or bar shapes. It play an important role in increasing the availability of plastics. The characteristics of machine: (1)Integral body,sturdy and durable,keep excellent performance after using long time (2)Heavy-duty bearing and dust protection device,the sound-proof board can provent vibration and noise effectively (3) The overloading protector on the motor and interlock protection device on the power source,double protection for the safety of human being and motor (4) Paddle-blades rotor adopting shear principle,made of high- chromium steel,shred various plastics easily (5) The gap between knives is adjustable.The knives can be dismounted when unsharp,to be used repeatedly,long time using life (6)Separable design,the bunker,main body,mesh frame are dismounted easily,convenient for bunker cleaning.